During the years when I was building my copywriting and marketing company, I almost never broke a commitment I made to another person, whether that person was a partner or client. Now, that didn’t mean I wouldn’t renegotiate commitments, I absolutely did that. But, one of my core values is integrity, and over the years I spent a lot of time and energy to live my life and run my business from a place of integrity. I may not have always succeeded and I most definitely made mistakes, but I always did the best I could in the moment. EXCEPT when it came to commitments to myself. Those, I broke. A lot. My commitment to my own writing and books? Dead last on the list. Even commitments to marketing my business or creating other income streams were close to the bottom of my to-do list. At the time, I called it “giving myself a break.” Typically, how it would play out is I would get a big client project or a lot of client work would walk in the door, and I would start to feel super overwhelmed and anxious about everything I had to do. So, I would “give myself a break” by moving or cancelling my own projects. I always told myself once this “crazy” period was over, I would pick up where I left off. And of course, I rarely did, except for select marketing activities. What I was really doing was giving myself permission to break commitments to myself. Now, how this ended up playing out for me is I kept doing it until one day something deep inside me started to revolt. About the same time my mother got sick with cancer, so I had both external and internal pressures to change. That combination finally did it. So, let’s talk about you. How are you showing up for your dreams and goals? Are you sitting down each day to honor them, even if that means writing a book you’re not sure anyone will ever read or writing blog posts for a blog no one is visiting or marketing a business that’s doesn’t seem to get any traction? It’s tough. I know. I’ve been there. But, here’s the truth. The more you let yourself off the hook or give yourself a break and not show up for yourself and your dreams and goals, the more you’re going to throttle your success. While it’s true I built a pretty successful business breaking commitments to myself, I was also often stressed, overwhelmed and consumed with worry. I burned out multiple times building that company. Now that I’ve made commitments to myself as non-negotiable as the commitments I make to other people, everything has shifted. I’m a lot less stressed and a lot less overwhelmed, even though I’m actually getting more work done every day. I’m also a lot happier and a lot more at peace. And the best part? I’m starting to see a lot more traction and momentum in my business, more than I experienced before. 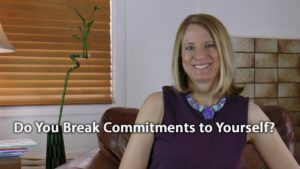 If you’re feeling stuck and trapped in a cycle where nothing you’re doing is working, I’d love to encourage you to take a moment and see where you’re showing up for yourself and where you’re breaking commitments to yourself. You may also want to check out an earlier Flip It episode titled “A Simple Marketing Exercise that Could Transform Your Business” and see what happens when you do that exercise. One of the reasons why it’s so easy to break commitments to yourself is because it’s not public. Only you really knows what you did. But, shouldn’t your relationship to yourself be the most important one in your life? I can tell you from experience, the more you show up for yourself, the more you’ll get everything you want.